This weekend, two buses will bring over 100 children and caregivers to reunite with their mothers at Logan Correctional Center, 180 miles outside of Chicago, in time for the Holidays. Families will make Christmas arts and crafts, play games, take photos with Santa, eat lunch, and children will receive gifts. Most importantly, mothers and children will receive the opportunity to spend crucial quality time together. The Reunification Ride was launched after the Illinois budget impasse led to a former bus program being canceled. 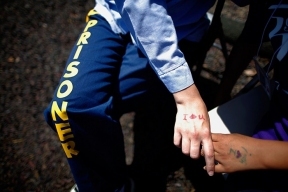 The bus had brought children to see their parents in prison, an essential connection that increases the probability of family reunification and decreases recidivism. The end of the bus program had a profound impact on Chicago children and the mothers whose only opportunity to see their kids was through this bus. After the cancelation, three Chicago-based organizations—Chicago Legal Advocacy for Incarcerated Mothers/Cabrini Green Legal Aid; Moms United Against Violence and Incarceration and Nehemiah Trinity Rising joined forces to create the Reunification Ride. Initially the coalition raised money for two buses to bring children to see their mothers for Mother’s Day in May of 2016. However, the coalition became determined to continue the program after seeing the impact on both the children and the mothers of being separated. To date, more than 300 donors have contributed to the Reunification Ride through a crowdsource campaign on the youcaring.com website. In addition, St. John’s Evangelical Lutheran Church of Wilmette and Temple Sholom of Chicago have each sponsored one month of the Reunification Ride. Altogether, donors have raised enough funds for nine bus trips, leading to almost 400 visits for families. The majority of women who are incarcerated in the U.S. are there for acts directly related to domestic violence, poverty, addiction and other traumas. In Illinois, an estimated 80 percent of incarcerated mothers have children who are under the age of eighteen, approximately half are under the age of ten. The majority of these mothers were the primary caregivers for their children before they were incarcerated, and many will remain the primary caregivers to regain custody when they leave prison. In Illinois alone, over 186,000 children have or have had an incarcerated parent. Sustained contact is crucial to family reunification, and to the well-being of children and moms. It is also directly correlated with a reduction in recidivism. In addition to transportation, the buses provide a community for kids whose parents are incarcerated, which can often be a lonely, traumatic, and stigmatizing experience. The majority of caretakers are grandmothers, and they, too, have connected with each other through the Reunification Ride. If you would like to support The Reunification Ride, head over to http://bit.ly/ReunificationRide2017. The Reunification Ride will take place on Saturday, Dec. 17th.